Jozetta Louise Cameron once again impresses readers with her inspirational poems – this book is the highly anticipated follow up to her first collection of poetry. 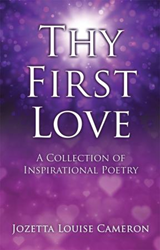 Jozetta Louise Cameron’s new book, Thy First Love: A Collection of Inspirational Poetry, ($14.99, paperback, 9781498424813) uses poetry to encourage the true church – the Body of Christ, who are Biblically born again – to continue to keep the faith and to never forget their first love, the Lord and Savior Jesus Christ. She emphasizes her theme particularly in the midst of a world that is becoming increasingly ungodly/evil – persecutions, the cares of this life, and the overall countless distractions that each person encounters. She believes that one must be steadfast in faith while following the Great Commission. The book tells about the Gospel, the Good News of Jesus Christ, and that salvation is available for anyone who will repent of their sins and believe in Jesus' death on the cross, burial and resurrection. Along with the message of seeking and serving the Most High God and Lord and Savior Jesus Christ, this book emphatically urges true believers of Jesus Christ, to witness by sharing the Gospel to lost souls. Jozetta Louise Cameron is a graduate of Jackson State University with a Bachelor and a Master of Arts Degree in English. She is a Christian writer/poet, whose devotion to God and dedication to her writing have continued to inspire her to encourage the church and to share the Gospel. Her fear (reverence) of the Lord and obedience to the Lord Jesus Christ has given her an urgency and boldness to witness not only in her daily life but also in her writing/poetry. This book is a follow-up to her first successful collection of poetry, Divine Revelations: Inspirational Poems. Xulon Press, a division of Salem Media Group, is the world’s largest Christian self-publisher, with more than 15,000 titles published to date. Retailers may order Thy First Love: A Collection of Inspirational Poetry through Ingram Book Company and/or Spring Arbor Book Distributors. The book is available online through xulonpress.com/bookstore, amazon.com, and barnesandnoble.com.